There are perks of living an expat life. 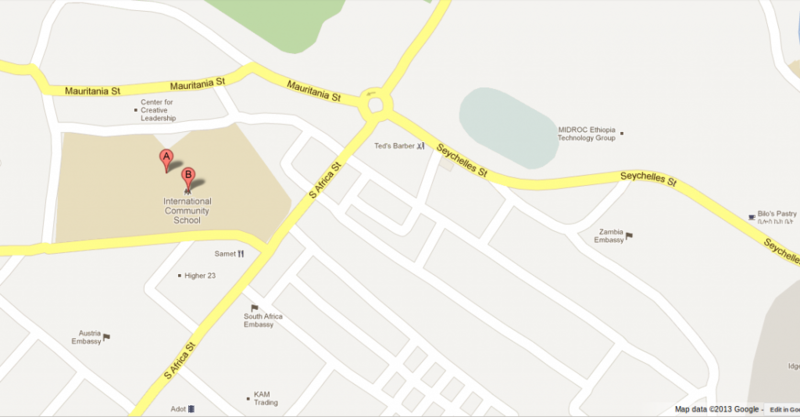 Besides living in intriguing places and mixing with a variety of cultures, there are also material and social benefits. 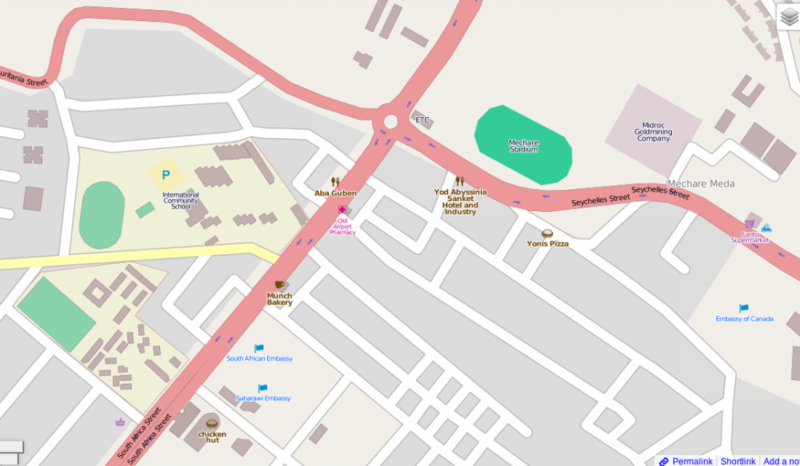 One of the social benefits – especially if you live in an important capital city like Addis Ababa – is having the opportunity to occasionally rub shoulders with visiting dignitaries and celebrities. This week, I’ve had the pleasure of meeting two, both very different but also both very inspiring. 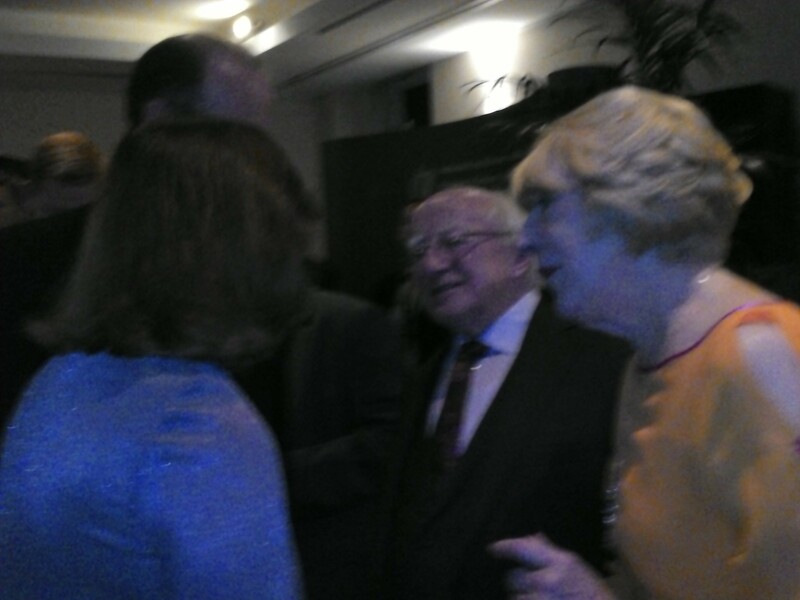 Last month we met the Irish Ambassador, Aidan O’Hara, and his predecessor, Sile Maguire, at the Radisson Blu and got to chatting. We hadn’t seen Sile in years so we asked her what she was doing. She’s now in charge of protocol at the office of the president and she was scouting out his upcoming trip to Ethiopia (and Malawi and South Africa). We wasted no time in asking if we were going to be invited to meet him and were reassured we would. 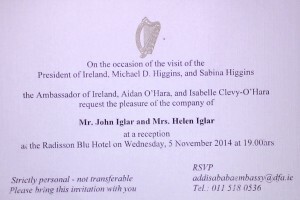 So when the invitation came last week, we were happy if not surprised. We were eager to meet the man. We’d heard his radio interview in which he ripped into the American Tea Party (calling them “wankers”! )and were impressed by his decency and eloquence. Any president who requests his salary be reduced is worthy of some admiration, as is any president who’s also a poet. We also had a personal connection: Helen’s dad had gone to university with him and asked us to say hello on his behalf. So we dolled ourselves up and headed off to the hotel. 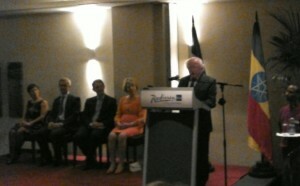 The place was thronged with Irish priests, embassy workers, workers from various associated NGOs, and other dignitaries. We reconnected with friends from the Irish community who we hadn’t seen in a while and waited for the president to arrive. Once he arrived – having just come back from a visit to the refugee camps in Gambella – he was introduced by Aidan and then gave a speech. It was a good speech (if lacking the vehemence of his radio interview!) and was received well by the crowd. Afterwards, we joined the formal reception line and got a few seconds to shake his hand and exchange a few words with him and his wife, Sabina. Helen told him that her father remembers him riding his bike around UC Galway and Sabina made sure to get Helen’s maiden name to try to place him. Then we were swept along and met Sean Sherlock, the Minister for Trade Development, and greeted Aidan and his wife, Isabelle. I was impressed and a little astounded at the schedule that someone in his position has to put up with. 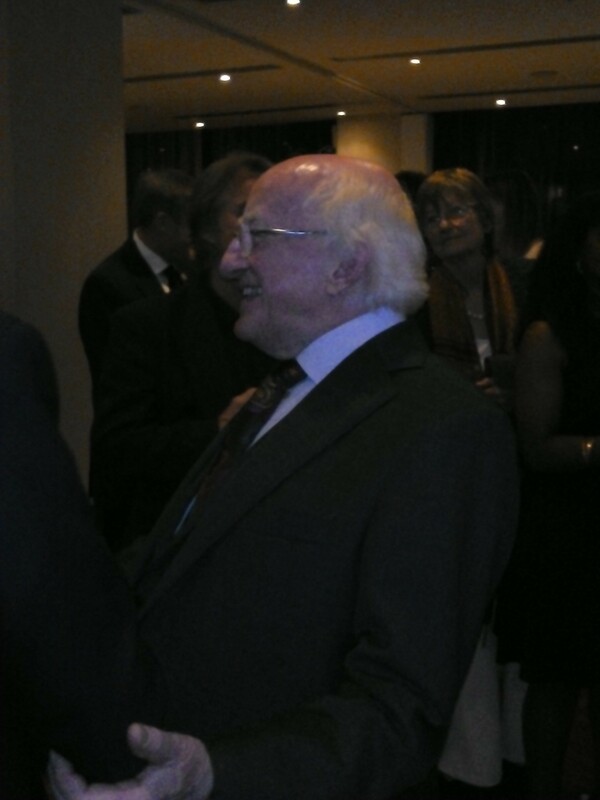 We had enjoyed food and wine while he stood and shook people’s hands and was pleasant. He’d just come back from a long trip, and he was heading off on another trip the next morning. He’s not a young man, but his week’s and night’s activities would wear out anyone. A while after the president left, we encountered Sean Sherlock again as he attempted to eat some food. He immediately stopped to greet us, and we had to insist that he finish his dinner! 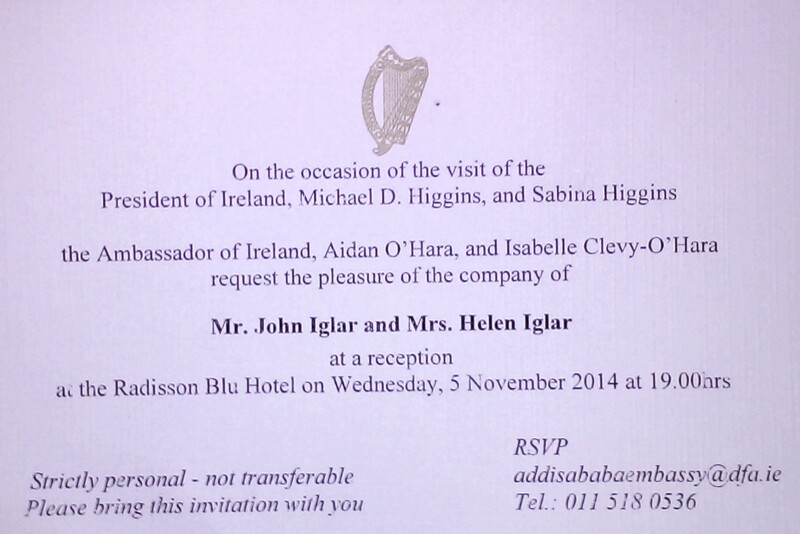 We congratulated him on the agreements he’d signed with Ethiopia, including direct flights between Addis and Dublin. He asked us about ourselves and we chatted a bit before he had to rush off again. There really is little rest for such leaders of government! We’d heard that the school was going to have a special assembly with a visiting astronaut, and I was particularly excited. I’m a bit of a “space cadet” and love anything to do with space exploration. 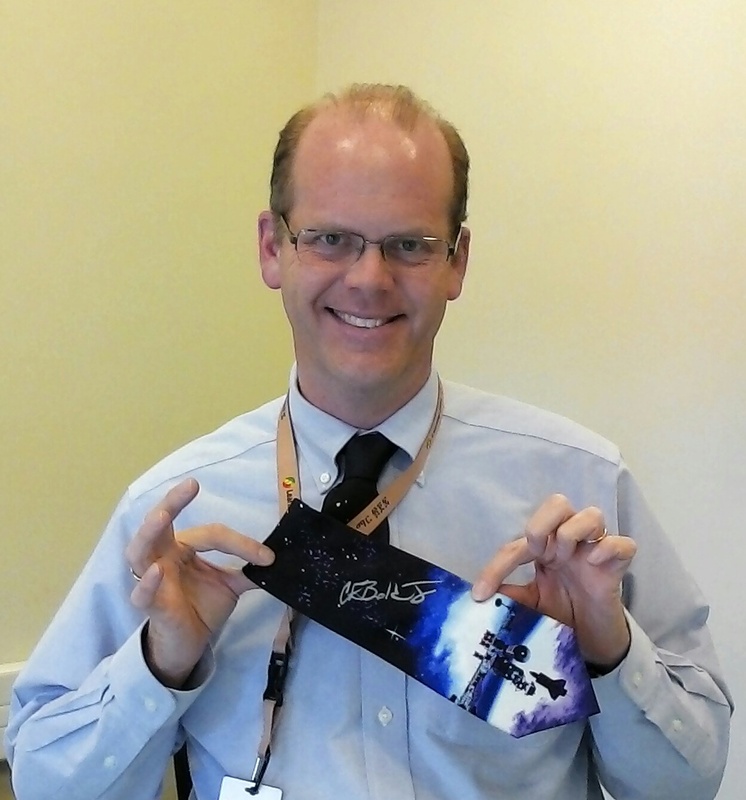 I’d dragged my family off to the Kennedy Space Center before the final shuttle launch and booked a lunch with Astronaut Mike Mullane as part of the tour. 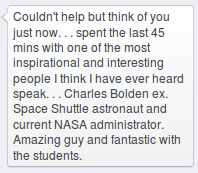 So I was particularly excited to hear that Astronaut and NASA Director Charles Bolden was going to visit. I remember watching his speech as the last Space Shuttle mission ended, and it would be great to meet him in person and hear him speak. So on Friday morning, I was particularly eager to hear him speak. And it paid off. After a bit of technical glitches that I had to help smooth out, we were ready for him to speak to the High School students at 8:00 a.m. He had a prepared speech and slideshow which was good, but he made a concerted effort to involve the students, asking questions and moving among the audience. I had to leave to go to a parent meeting, but fortunately I got back in time for his second session with the Middle School and upper Elementary. This second session went a little differently. He started out the same as he had with the High School students, telling the students that they were welcome to ask questions anytime. Immediately, dozens of students shot their hands up in the air. He laughed and answered the first question, and then more hands went up. The session went on like that the whole time. 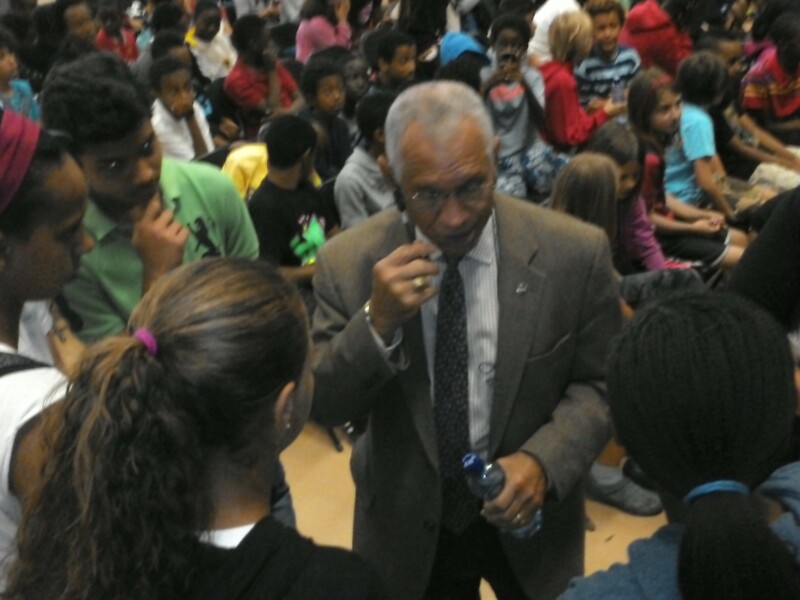 Bolden basically abandoned his set presentation and answered the kids’ questions: everything from “what was it like being in space?” to “have we found signs of life on Mars?” to “is Pluto a planet?” He was game, engaging, and great at thinking and talking on his feet. 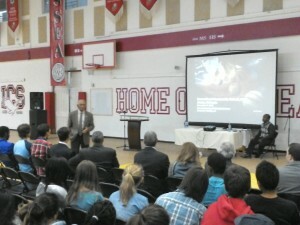 He worked in some elements from his prepared talk, and directed his information at the students’ level. I was very impressed. A colleague told me that her daughter (a sixth grader who normally doesn’t say such things) told her that she thought his talk was inspiring. You can’t do better than that! …as I said, there are perks to being an expat! Roll out the red carpets, here come the priests! “When are they coming?” had to have been asked at least ten times. “Which way are they coming?” was asked a few times. People looked at their watches & scanned both ends of the street. “Didn’t she ask that already?” Leulseged asked me. He was confused by the multiple questions. I laughed and said that the problem was that if such a procession was happening in the US or Europe, the parade route would be published in the newspaper with specific times for road closures. 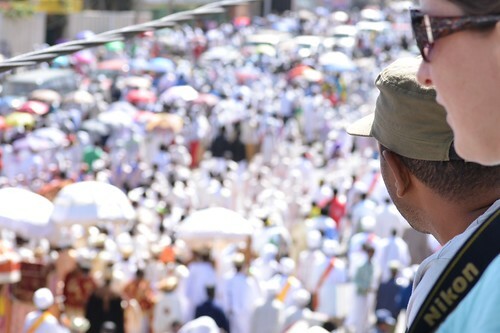 It’s hard for people used to that to accept the relaxed vagueness of the timing of the Ethiopian Timket parade. 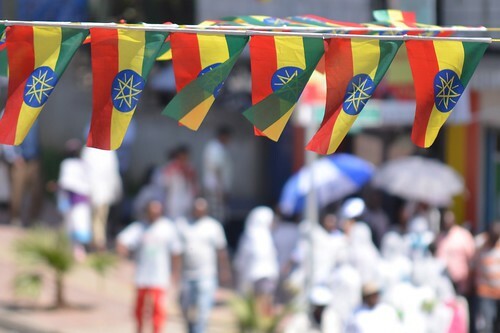 So there we stood, a dozen or so farenj and one local, watching the bustle on the street below and waiting for one of Ethiopia’s most colourful spectacles to start. 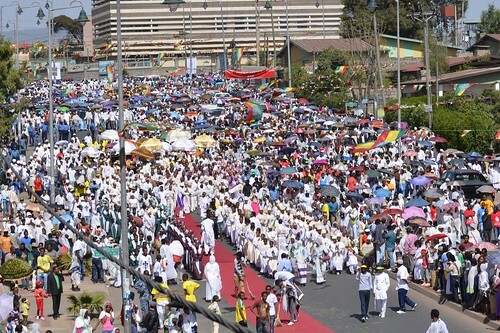 Timket is the Ethiopian Epiphany – 12 days after the Ethiopian Christmas which comes in early January. 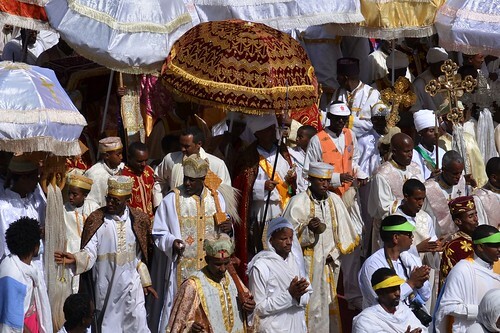 (The Ethiopian Church follows an Orthodox calendar.) The main public spectacle is the parade or procession. 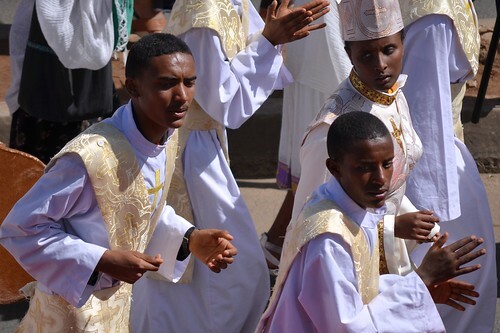 Priests from each church take the tabot – a copy of the Ark of the Covenant (the original is up north in Axum – so they’ll tell you, but they can’t show it to you!) – out of the church for a ritual baptism evocative of Jesus’ own. After an overnight ceremony at the river – I’d heard the service dimly from my house – the tabot was now returning back to its home church. As the procession was coming down the main street between my house and the school, it was a perfect opportunity for watching and recording the colourful celebration. We stood on a balcony overlooking the street. We watched the build-up as people found shady spots to sit and see the street, more dedicated ones walking up the street to join the procession. Police arrived to control and then shut junctions, kids looked up at us and waved. Soon the crowds thickened, we heard distant drumming and then the carpet brigade came. The red carpet is in sections, and teams of men unroll them one after another to form a clean and special path for the priests bearing the tabot to follow. 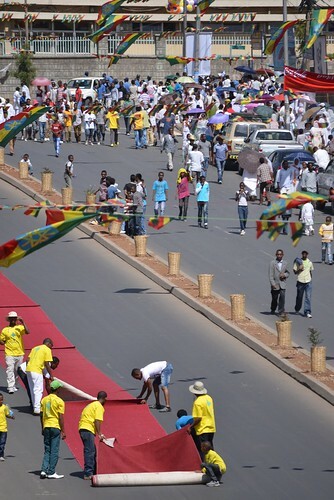 They then run to the rear of the procession so they can roll up a vacated carpet section and then bring it to the front. Repeat. Again and again and again! Various groups of people – mostly men, with some women – would sing songs, beating drums and blowing tin horns. They would march down the street, singing and dancing, waving flags and tinselled crosses clapping and exhorting the crowd to join in. Occasionally – and often it was directly opposite us – they would stop and form a circle, dancing in and around each other, or clapping on the few in the center. 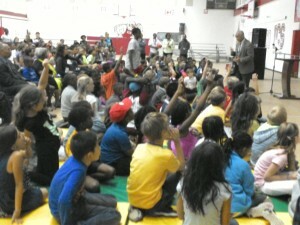 The enthusiasm and excitement was palpable and infectious. Finally, the crowds surged around the corner and the street filled – priests and tabot and church officials on one side and the general population on the other. The priests were brightly decked out in their fine robes, carrying beautiful embroidered cloth umbrellas to shade them from the hot sun. Reds and golds and plenty of white glittered in the sun. On the other side of the street, most were dressed in traditional white clothing – particularly the women. 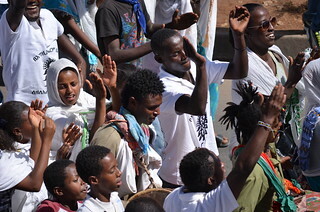 Many danced and sang along with the church bands – leading the procession with drumming and singing. The procession quickly passed by, with only a glimpse of the priests carrying the tabot over their heads, covered with thick gold-embroidered cloth. The teams rolled the carpet up behind them as the procession headed down the street towards the church. More groups of unofficial singers and dancers followed, the crowds thinned and the police started traffic flowing again. Melkam Timket!